Modern, convenient, centrally located. Excellent value for money. This is the second time I stay in these services flats and I will repeat. Staff was courteous and helpful. She gave us dining tips and booked a cab for us for our early morning trip to the airport. I enjoyed the cleanliness and layout of the apartment. The apartment was fairly big for four people and had an absolutely gorgeous view! The flat is new, with easy access to the metro and we'll equipped for a long weekend. the place is clean and easy access to subway and restaurant. 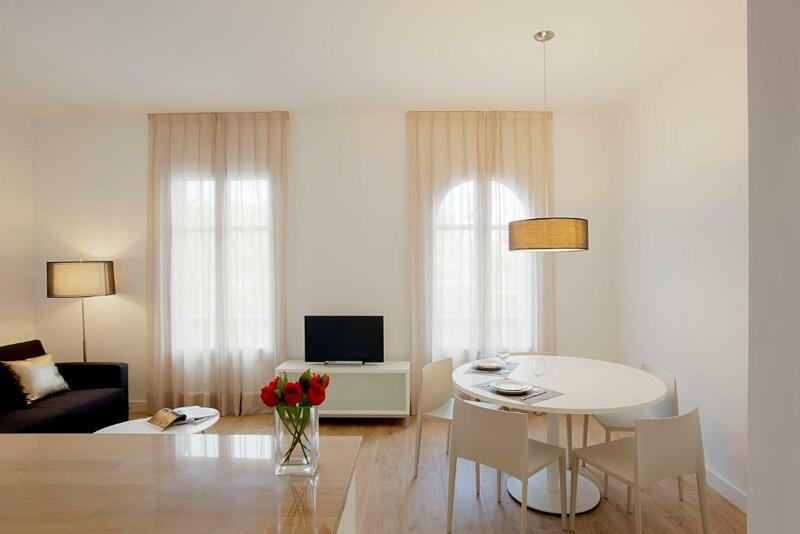 Lock in a great price for Barcelona Apartment Viladomat – rated 8.6 by recent guests! One of our top picks in Barcelona.Featuring free Wi-Fi and a balcony, Barcelona Apartment Viladomat offers air-conditioned apartments located a 4-minute walk from both Entenca and Hospital Clinic metro stations. 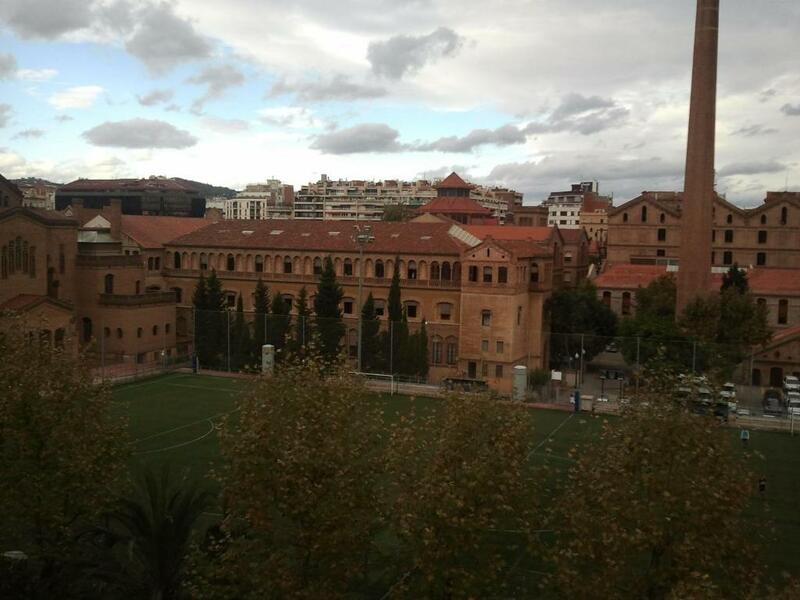 The Eixample neighborhood offers many shops, restaurants and bars, and Jardins de Montserrat Park is a 2-minute walk from the apartments. Barcelona Apartment Viladomat is 0.6 mi from Sants Estació Train and Metro Station, and Park Guell can be reached in less than 40 minutes by public transport. Gaudi's La Sagrada Familia is a 15-minute metro ride away. 뀐 Located in the top-rated area in Barcelona, this property has an excellent location score of 8.4! When would you like to stay at Barcelona Apartment Viladomat? Featuring a small french balcony with park and city views, this modern apartment offers a living-dining area with sofa and flat-screen TV, and the kitchen includes an oven with hob, dishwasher, microwave and fridge. There is a double room with private bathroom, a bedroom with a bunk bed, and an additional bathroom including shower and hairdryer. Free towels and bed linen are provided. Featuring a large balcony with park and city views, this modern apartment offers a living-dining area with sofa and flat-screen TV, and the kitchen includes an oven with hob, dishwasher, microwave and fridge. There is a double room with private bathroom, a bedroom with a bunk bed, a single room, and an additional bathroom including shower and hairdryer. Free towels and bed linen are provided. This apartment features a living room with a sofa bed and a flat-screen TV. The kitchen is equipped with a microwave, dishwasher and a hob. A washing machine is also available. The apartment has a double bedroom and the bathroom comes with a shower and a hairdryer. Bed linen and towels are provided. House Rules Barcelona Apartment Viladomat takes special requests – add in the next step! Barcelona Apartment Viladomat accepts these cards and reserves the right to temporarily hold an amount prior to arrival. Please inform Barcelona Apartment Viladomat of your expected arrival time in advance. You can use the Special Requests box when booking, or contact the property directly using the contact details in your confirmation. White walls were a bit grubby. Could do with a freshen up. Could have done with a bread knife, basin and more hangers. Lift door made a lot of noise when people using it. Apartment was spacious and bright. Beds comfortable too. The frequency of the cleaning was too low. Only once in 10 days. Most apartments have at least one bottle of drinking water as guests arrive, they also have, washing detergent and international plug adapters or USB ports for charging. This apartment could do with this additional amenities. Due to our flight being delayed we were out of our time slot to be met at the apartment by about 15 mins and I contacted the number provided to let them know. I was told it was quite late in the day which is strange as it was only 6.20 pm and then told we need to pick up the keys at a different location. When you are in a foreign country this can be quite daunting as you don't know where you are going and luckily our transfer was able to divert and take us to pick up the keys. Picking up the keys was fine, however we then had to make our way to the apartment with our cases and subsequently got very lost so it took us 30 mins to get there. Every room was bright and airy except the single bedroom which was very dark because the window looks out on to pipework which was not really a major problem until you realised eveytime someone turned the bathroom light on, it shone straight in to the bedroom. No english speaking tv channels was disapointing. I understand leaving the apartment tidy but having to put your own rubbish in the rubbish bins on the street l think is a bit excessive and also you end up being the cleaner before you leave because you are so worried that it won't be up to scratch. The apartment was spotless and exactly like the pictures as advertised. we had a hugh terrace area off 2 of the bedrooms which included sunlounges which in the summer would have been lovely to relax on. The kitchen was very modern and we had a welcome pack which included some coffee, tea, cleaning products etc which was a nice touch. Close proximity to a metro station which was great and although the apartments seem to be in a residential area we felt safe walking around and coming back at night. Good value for money not close to the touristy areas but really easy to get to them. Very nice apartment, perfect stuff, very nice madam at the reception. I can't think of anything we didn't like. Only the check in was a bit confusing because we did self check in due to arriving late at night and we had to fill in quite a lot of paperwork but otherwise everything else was perfect. The apartment was really nice and spotless clean. We enjoyed our staying. The terrace was fantastic. Beds very comfortable. I would definitely choose this apartment again. Enough place for family with two children, all things for live are already there. You can wash, dry, iron your clothes, make food on kitchen. The apartment is in the center, two metro station nearby. There is two bathrooms. Apartment was quality, I had booked with friends and they were not confident I had booked a good place but when we walked through the door we were amazed. Brilliant. The location was a little out the way and not many restaurants or bars with close proximity, however, very good transport links close by which enabled us to access Barcelona's main attractions easily. The apartment was very clean spacious with good facilities. Lovely apartment with a really comfortable bed and nice shower, Perfect for 4 people!